Whiteville— Columbus Charter School (CCS) received glowing reviews from the NC Department of Public Instruction (DPI) this week for the strength of the school’s Beginning Teacher Support Program. The regular compliance review consisted of DPI’s on-site examination of program files, interviews with school staff, and survey results from teachers. All NC public schools are required to offer a Beginning Teacher Support Program to assist new teachers in completing mandated licensure requirements during their first three years in the classroom. CCS has built upon the basic mandated requirements of this program to create a support system that not only serves the State’s purpose of guiding new teachers through licensure protocol, but that works to actively invest in new teachers. CCS’ program earned DPI’s highest designation of “Distinguished” in various assessment areas. 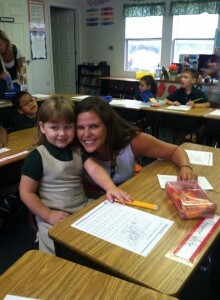 At CCS, beginning teachers work closely with a lead teacher from their grade level and are paired a mentor. Beginning teachers are granted release time during which they can observe or meet with their mentor. In return, mentors regularly observe beginning teachers and provide feedback. Through its management company, The Roger Bacon Academy (RBA), CCS provides a Coaching Department of curriculum specialists to assess, model, and streamline instruction and classroom management procedures during regular classroom visits. Further, regular data meetings assess student performance from weekly assessments in each subject. This allows teachers to know, in real time, the effectiveness of their instruction, as well as particular problem areas on a class-wide or individual student scale. Particular to CCS and its sister schools, this arrangement is effective in creating great educators of all experience levels. Beginning teachers receive both specific diagnosis and remedy of problem areas, in addition to seeing their successes quantifiably demonstrated in student performance data. In addition to commending CCS’ teacher support program, DPI recently confirmed the school’s good financial standing. In a letter to Headmaster Steve Smith, Alexis Schauss, Director of DPI’s Office of Financial and Business Services, stated that her office did not find, “any instances of noncompliance” in the school’s 2013-2014 financial audit. In keeping with the total accountability required by the Office of Financial and Business Services and the Local Government Commission, independent auditors yearly submit a comprehensive 50-page report on the school’s financial and regulatory compliance each October. CCS is a tuition-free public charter school serving nearly 1,000 public K-8 students at its Whiteville campus and provides the highest scoring elementary and middle schools in both the Whiteville City and Columbus County school districts. For more information or to apply for 2015-2016 enrollment, please call 910-641-4042 or visit www.columbuscharterschool.net.